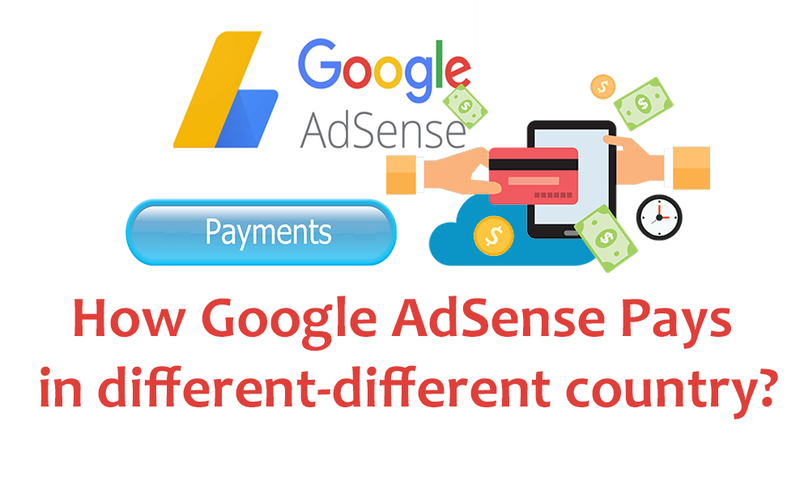 How Google AdSense Pays in different-different country? Google AdSense is the most popular monetization technique used by bloggers, yet it remains confusing for new users. Its dashboard is easy-to-use and there are many help pages to understand it, even though there are always questions raised in mind about signing up, account approving, account ban, optimization and other things. It is true that AdSense is a Plug-and-Play advertising network, but to take advantage of its prospects properly, it is important that you know more about it. By which you can earn more, that too without any investment. "Can you tell us how Google AdSense pays in India? Do they pay by check or from local bank transfer or from EFT? " AdSense pays different rates in different countries. They also pay by EFT Transfer, Check and Western Union Quick Cash. In countries such as India and Pakistan, especially like countries like US, U.K., and Australia, approving an AdSense account is not easy. This is due to the issue of spam and fake AdSense account in India. Adsense offers a payment from EFT. They convert your earnings to INR and then pay. Generally speaking, AdSense's USD to INR conversion rate is high, so this will not be an issue for you. The AdSense team is increasing the payment option in many countries and they have already added an EFT Payment option to Indian publishers. When you sign up, check all the details are accurate. Put your name right there in your bank account. Your name should be same on your AdSense Check and the same name in your account. AdSense will send a PIN to the address you provided when signing up. This will work as an address verification in a way before payment. With AdSense EFT payment, you can also get the payment from the name of the other payee. You can also look at the official guide to read more about AdSense payment policies. You can update payment preference by the 20th of the given month. You can also set a minimum payment threshold for the payment and it should be more than $ 100. In India, AdSense publishers will receive standard delivery checks via the local courier service Blue Dart, which will not be charged separately. Checks sent by Blue Dart should arrive within 10-30 days of check date. Blue Dart is not able to deliver whole India service. So if you live in a location where they do not give the service, then your check will be sent from registered post and should arrive within 2-3 weeks of the mailing date. If you have not been able to receive the payment even after the issue, then you can fill the form and submit a request to re-issue it. I hope this post will have answered all questions related to AdSense India Payments. But still you are free to ask and comment if you have any question. If you like the post, then share it on Facebook, Google+ and Twitter.